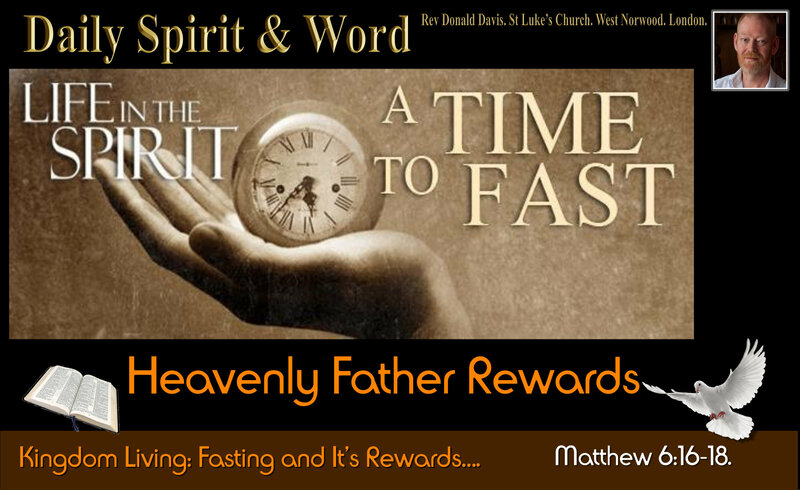 Daily Spirit & Word: 792: A Time To Fast. In the life of the Spirit there is a time to fast, but let’s do it right. Good morning my friends, I don’t know about you but I find fasting quite difficult. Going without food is not natural or normal. We were born hungry, just observe a tiny little baby and you’ll soon see that when it gets hungry it cries out loud, sometimes very loud. So too when we get hungry, we might have gone without food for a few hours and we’ll return home and say to our family; “I’m starving” or “I’m famished”… but we’re not really, we’re just a bit hungry. So eating food regularly is natural and normal. Going without food is not, so why would we fast? Why would we go without food on purpose? However, notice Jesus’ words, “When you fast”… It’s like Jesus expects His followers to fast regularly, because He does not say, “If you fast”..
16 “When you fast, do not look sombre as the hypocrites do, for they disfigure their faces to show men they are fasting. I tell you the truth, they have received their reward in full. 18 so that it will not be obvious to men that you are fasting, but only to your Father, who is unseen; and your Father, who sees what is done in secret, will reward you. (He will REWARD YOU: Openly or Publicly). Like giving and prayer (See yesterday’s devotion), this open or public reward by our Heavenly Father should not be our motivation for fasting. However, accept it as a promise of the LORD that when you fast with right motives, your Heavenly Father will reward you openly. Verse 16: In ancient times in Israel people fasted regularly. The religious Jews fasted twice a week (Luke 18:12). However, they also had a tradition that they’d dress in a certain way and put things on their faces so that everybody knew they were doing something ‘religious’. Some I’m sure were trying to get closer to God, but others, as our LORD points out, were doing it to impress other people. Jesus has harsh words for them, “Hypocrites”… They’re not really doing it to honour God or draw closer to Him, they’re just doing it for show. You can’t FAST and have sin in your heart and expect the LORD of Heaven to bless you. i.e. Don’t let anyone know by your appearance that you are going without food to get closer to God. In the same way don’t go getting all dressed up for a fast, if that is not your normal attire. Just be as normal as you can be when you are fasting for God. Verse 18: Jesus gives us the reason we’re to be as normal a possible: “So that it will not be obvious to men that you are fasting, but only to your Father”… Only the unseen God of Heaven will know you are going without food. If you are married, then your wife or husband will probably know too, that’s to be expected in any close relationship. But don’t let anyone else know. 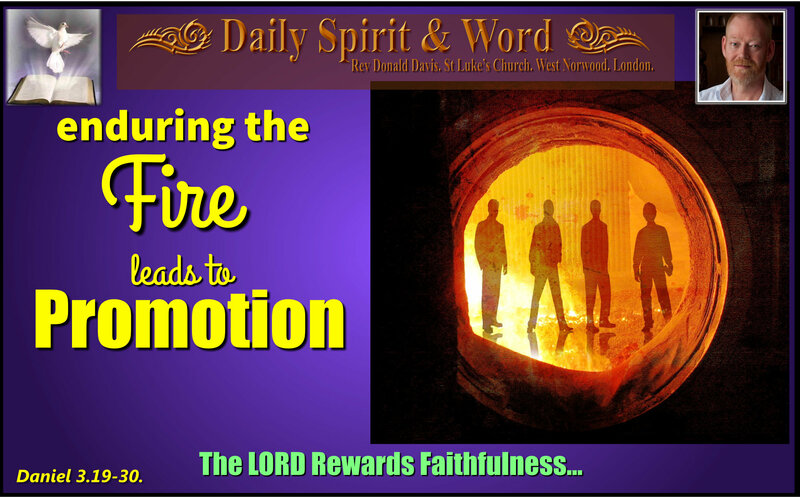 REWARD: “When your Father in Heaven sees what is done in secret, He will reward you openly or publicly”. When you really want to get close to God, He will always reward you. What’s God saying in this little passage from James? “Come near to God” what will God do? “He will come near to you”… i.e. there’s no question about it, He will come near to you. This is a wonderful promise of the LORD of Heaven to come to you when you come to Him. However, we’ve got to believe, trust and accept it by faith. Because without FAITH it is impossible to please the LORD. If we don’t come expecting then we won’t get anything. 6 But when he asks, he must believe and not doubt, because he who doubts is like a wave of the sea, blown and tossed by the wind. 8 he is a double-minded man, unstable in all he does. In FASTING when you draw near to God, by going without food, if you don’t come expecting, then you won’t get anything. So my friends, FAST regularly, draw near to God, believe His promises that He will come to you; He’ll lift you up, bless you openly (publicly), He is the rewarder of those who seek Him out. He will reward you openly. He will lift you up when you come to Him. He will reward you when you seek Him in faith. Sometimes we don’t get because we don’t ask. I’ve known many wonderful Christians who’ve loved the LORD, but forgotten to ask when they are in need. I’ve done it myself. Just the other day, I was in a hurry to get out the house to go and pick up my wife, but I couldn’t find my wallet. I searched frantically but to no avail, then I stopped and prayed. “LORD, I need to find my wallet, You know where it is Lord, please show me”. Within a few seconds I got a picture of a shelf in my study, I put my hands up and there it was. I didn’t find until I asked. The LORD has amazing ways to remind us to seek Him and search for Him and when we do, we’ll find Him, always. So today, FAST, it’s not easy, it’s not normal to go without food, but it yields rewards for your Father in Heaven. Prayer: Heavenly Father, I come to you today in faith, believing Your promises that when I seek you, and seek you with all my heart, I will find you. (Jeremiah 29:13). I’m going to ask You Father for my needs …………………………… (Name them specifically) I believe Your promise that I will receive. I’m going to seek your direction for my life ……………………………. (What decisions do you have looming in your life?) I believe Your promise that I will find. I’m going to knock on doors ………………………………… (take steps in the right direction and try some doors). I believe Your promise that it will be opened. Your Heavenly Father’s Heart is to REWARD His beloved children. The Ancient GOSPEL: How God Saved Precious Souls. Are not very different to the ways He’s winning, warning and wooing people today. Good morning my friends, I love the way that bluebells come back every year and seem to get better and better the longer you leave them in the ground. You know my friends, long before the New Testament was completed our ancient brothers and sisters in the faith used the Old Testament to proclaim the Good News of the Lord Jesus Christ. When Paul was writing to Timothy, he understood the Spiritual nature and value of the Scriptures. 2 Tim 3:16-17. Therefore today I’m going to show you that picking up a text from the most ancient of the Old Testament books, the book of Job, which is considered by some to be the oldest, we can see that God used the same ways to lead men to the awareness of their need of a Saviour thousands of years before Christ came and how the LORD provided them with a pathway towards Salvation, New Life and a much closer walk with God. Our focus text today is from the book of Job. 14 For God does speak—now one way, now another— though man may not perceive it. 18 to preserve his soul from the pit, his life from perishing by the sword. 20 so that his very being finds food repulsive and his soul loathes the choicest meal. 21 His flesh wastes away to nothing, and his bones, once hidden, now stick out. 22 His soul draws near to the pit, and his life to the messengers of death. 25 then his flesh is renewed like a child’s; it is restored as in the days of his youth. 26 He prays to God and finds favour with him, he sees God’s face and shouts for joy; he is restored by God to his righteous state. 27 Then he comes to men and says, ‘I have sinned, and perverted what was right, but I did not get what I deserved. 30 to turn back his soul from the pit, that the light of life may shine on him. 32 If you have anything to say, answer me; speak up, for I want you to be cleared. WOWzer! You think you know the story of a book in the Bible, then the Lord opens it up by His Spirit and you suddenly observe new depths. You know the story of Job: How he was viewed by the LORD as a righteous man, then Satan came to test Job and was allowed to do so by the LORD. Satan wanted to see how far he would need to go to make Job curse God, but God knew Job’s heart and allowed the test. Remember Satan tests and tempts us to make us fail and fall from God’s Grace. The Lord, on the other hand, allows testing to come, so that we’ll be encouraged, strengthened and grow towards maturity in the Christian faith. God wants us to succeed and pass every test. First: God Speaks: (verse 14). Yes indeed my friends, God speaks today, as He did in ancient times, but there are hard hearts and deaf ears today, just as there were back then. a) They needed Conversion: Verse 14. (Even if they are unaware of it). b) They needed Repentance: Verse 17. (Pride says in the heart, “I don’t need God”). Though men are deaf to God’s voice in Creation, though they may not listen or respond to an evangelist (Messenger), His heart so longs for men to turn in repentance and admit their need of God, that He’ll use the Ancient methods to turn are heart and soul towards Himself. a) God Does ALL these things to a man: Job 33:29 “God does all these things to a man— twice, even three times—” He’s doing them again and again and again, to AWAKEN men and women to their need of God. b) God Speaks in their EARS: Job 33:16 “he may speak in their ears and terrify them with warnings,” Remember my friends, The FEAR of the LORD is the beginning of wisdom. Kidnappers: When someone gets kidnapped, the kidnappers ask for a RANSOM, it’s the price that needs to be paid to set the captive free. It’s the same today, God has found the RANSOM, He paid for mankind’s Salvation in the life and blood of His One and Only Son, Jesus Christ. (WOWzer! Can you see the Gospel in the ancient text today?)…. Jesus Christ has died to set mankind free from Sin, Satan and Death and Hell. This is the very verse that JUMPED out at me as I was reading Job this morning… God doesn’t want anyone to perish and end up going down to the pit of Hell, but everybody to come to repentance, that’s why He’s speaking so much to men and women who will not listen to Him. God used trouble, hardships, warnings, dreams, visions, revelations, to turn a man from the error of his ways. A life lived without reference to God’s Holy Standards, a life lived without God is a Rebellious state and God wants people to come and confess (admit) their sinfulness, to turn from their wicked ways, be converted, and to receive His Divine pardon and New Life. My friends, our Souls are even more precious to God than they are to us. No one would sell one of their eyes for even £100,000 punds would we? Would you? NO of course not, but why do we exchange our eternal souls for a few moments of pleasure in this life today? God wants to SAVE us more than we want to SAVE ourselves. Finally: When We’re SAVED by God the REWARDS are the same. a) The Ransom Price Has Been Paid: Verse 24. Jesus Christ. b) The Response Required Is The Same: Job 33:27 “Then he comes to men and says, ‘I have sinned, and perverted what was right, but I did not get what I deserved.” We deserve DEATH & HELL, but God’s GRACE is revealed by the RANSOM price He paid in Jesus Christ. It’s also revealed in our most famous verses from the New Testament: John 3:16-17. My friends, when we today HEAR the GOOD NEWS and RESPOND to God’s Voice, we’ll also see the LIGHT. We’ll walk with God for the rest of our lives and for all eternity. We’ll be REDEEMED from the PIT. 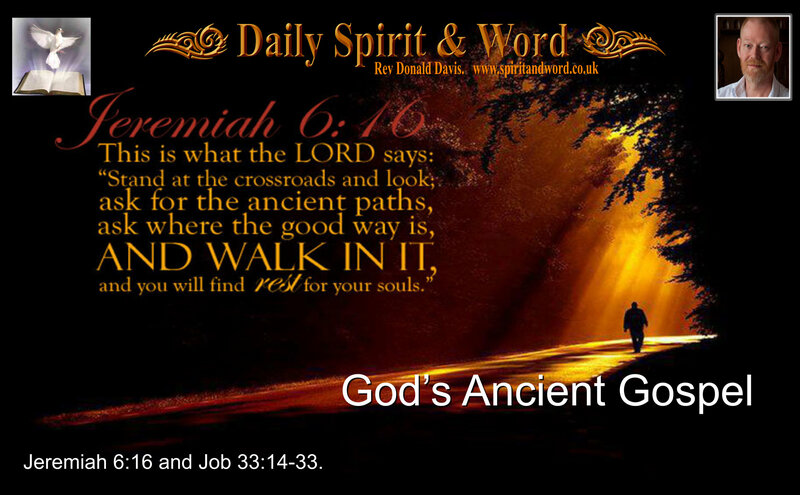 All God’s People today will say, “I WILL walk in His Ancient paths”… Amen! That fact that the first Believers preached the Gospel from the Ancient Texts of the Bible should be an encouragement to us today, knowing that God’s WORD is the Inspired, Infallible, and Indefatigable WORD of God. Also, God’s Salvation PLAN has always been the same and His Ancient Gospel is Revealed in it’s pages. Praise the Lord! He’s the same, yesterday, today and forever. Amen. Have an awesome weekend with your GREAT Saviour, the Lord Jesus Christ.